Gil Parris nearly won a Grammy with a solo guitar performance of "Pop Goes the Weasel," and that tells you everything you need to know about his signature blend of virtuoso chops, mad-scientist inventiveness, and art-school cool. Anyone who can get a public-domain song nominated for one of music's most prestigious awards (seriously, you should check it out here if you haven't--it will fry your brain!) is one heck of a player, but focusing on that one outlandish achievement shortchanges Gil Parris's varied work as a sideman with a who's-who list of arty jazz cats as well as his six stellar solo albums. Mr. Parris wears many hats in the musical world--he may play burning-hot jazz-inflected blues like these one night, then funky fusion the next, followed by a rock session on Friday. So, when Ken and Joe from Reverend approached Gil about doing a signature model, one thing was clear: it had to be the sort of musical Swiss Army Knife that could handle anything Gil could throw at it. They have returned victorious from this tonequest bearing a guitar with a plethora of inspiring sounds hiding within its deceptively simple controls. It can be a bit exhausting to find all the cool sounds in a guitar this versatile, but never fear: the Wildwood team has your back. Here's a quick rundown of the many mellifluous musical morsels the Reverend Gil Parris has to offer. In all positions, one things that sets the Reverend Gil Parris apart from the pack is how useful the tone knob is. While many tone knobs make your guitar sound dull and lifeless, Reverend's treble-bleed circuit allows players to maintain a warm yet vibrant tone even with the knob on 0 by ensuring that you don't lose any important treble frequencies. You'll love using the whole new palette of lush blue and purple timbres this circuit opens up, especially in conjunction with Reverend's legendary bass contour knob! In position one, the bridge humbucker gives you you a solid brick of punchy midrange to go with sweet, glassy highs and tight lows. It's the sort of bridge humbucker sound that begs to be plugged into a crunchy Marshall half-stack: muscular and mean, but clear. When you roll off the bass contour, the high-end becomes airier and more open, and the midrange gains a P-90-esque quack in the upper midrange. When you roll the tone off, it makes your guitar sound like a crying cello wailing away from the dark side of the moon. With both knobs on full, the first in-between position gives you a quintessential bright, fat rock sound. With every knob on full, its vocal upper-midrange conjures a mental image of Jimi Hendrix as a bodybuilder: powerful, but with a smooth, soulful presence in the highs. With the bass contour rolled off, it's a whole 'nother animal! It has a slightly-scooped voice that (oddly enough) works great for both country twang and righteous funk. It's warm and round in the lows, but full of delightful quack and bell-like note bloom in the highs. Chicken pickers and Parliament fans will find much to love here! Roll off the tone AND the bass contour, and it makes your guitar sound like someone practicing mid-period Miles Davis tunes on a muted trumpet through an open window in the house next door: muffled but forceful, with impenetrable cool. If you keep the tone rolled off and bring the bass contour back to full, the Reverend Gil Parris can do an excellent impersonation of a jazz box! It's airy and warm in a way that evokes memories of breezy summer nights. The middle pickup is a classic fat, punchy single-coil. It has broad, dense midrange, clear highs, and tight lows; in other words, if you like Texas blues, the middle position may become your pride and joy! However, a quick flick of the bass contour knobs lands you squarely in funk territory. If you like Niles Rodgers, Motown soul, or if you just need a little more bottom in your funk chords, this configuration will give you endless delight. If you turn the tone knob to zero, all of a sudden this pickup sounds like an obsidian knife: smooth and dark yet cutting. This in-between position sounds fat like an NFL offensive lineman: girthy, but with lots of muscle and definition underneath the weight. The low mids become quite powerful with both knobs on full blast. When you roll off the bass contour, the upper-midrange snaps into focus to complement the thumping low-midrange. If you've ever wanted your guitar to sound like a female blues singer, just push the tone knob on down to zero! The neck humbucker is an absolute delight by itself. It has beautiful brassy lows to go with sweet, singing highs sure to inspire expressive leads. With the bass contour rolled off, it sounds like an overfed Wide-Range humbucker from a seventies Tele mixed with a warm P-90: open and airy yet richer than a dot-com magnate! With the tone off, it sounds like an ES-175 that lost a hundred pounds on some newfangled Paleo diet: meaty, but lean. Well, there you have it: all of the fun tones the Gil Parris Signature has to offer. 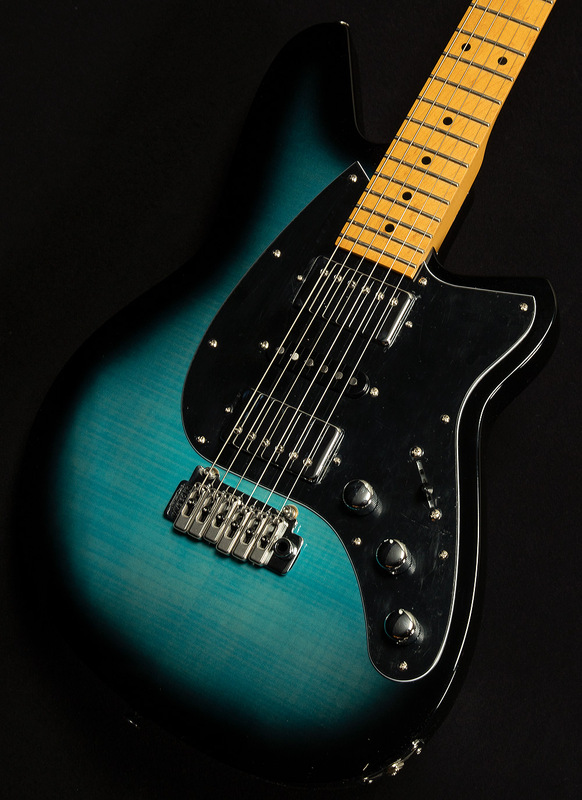 When you consider that this guitar has all of Reverend's player-friendly appointments (for instance: a comfy medium oval neck, locking tuners, a 12" radius, and a Boneite nut) AND an abundance of inspiring tones, one thing becomes clear: the Gil Parris signature is a sonic Swiss Army Knife. We are proud to showcase it for our exceptional customers, and we are excited to see how it inspires you.